This blog post is for Dog Agility Blog Action Day September 2013 on the topic of “Aging”. In a recent conversation with a colleague in the fitness industry, I heard something that fascinated me. As a rather fit person and well educated professional, she surprised me when saying she expected to quickly bounce back from a recent (and severe injury). Being of similar age and not too uncommon educational backgrounds, I started thinking. Thinking about why our impressions of recovery would be so different. Why was it clear to me that this recovery would take much longer than she expected. Why? Because of our differing experiences in life! One person having had very few injuries in life, the other more injuries and surgeries than can be counted on one hand. I continue to ponder this as I’m preparing to teach the fall session of Functional Fitness for Agility Handlers classes (shameless plug). I ponder it because it seems that is my niche. A niche I believe I was unaware of until now. I didn’t realize that what I offer to clients, beyond the exercise science and sports medicine resume, is experience. Experience with injuries, age, physical limitations and challenges of a “less than ideal” structure. And THIS is why I’m different. Not in a bad way at all. I just bring to the plate something different. You see, I’ve always known that experience commonly leads someone into their profession. I became involved in sports medicine after my *first* ACL tear. Until then, I was certainly going to be an accountant or lawyer (those of you who know me can laugh now). I believe the same holds true for others in the fitness industry. I’ve lost track of how many times I’ve heard careers credited to “I used to be a body builder” or “I workout a lot and love it”. MY career can be credited to experience of nontraditional successes…successes of overcoming challenges. This is where I realized my strength is. I HAVE had injuries. I DO have injuries. I HAVE had setbacks. I’m NOT an energizer bunny with limitless energy. I DO find motivation challenging. I find exercise just as hard as every one of my clients. Does that make me a failure at my chosen profession? Absolutely not! It gives me an edge and allows me to understand the challenges my clients face. I’ve had experience “in their shoes”. I feel my age. I AM my age. And my “age”, which varies by body part these days, is a reflection of my experience. Experiences that taught me beyond the textbooks…that taught me how to respect the changes that happen to body tissue after an injury…that taught me to acknowledge and be mindful of limitations…that taught me to work with the structural challenges in a body…that taught me mind, body and spirit are one…to be thoughtful and purposeful with movement so we can live healthier lives and continue to do what we want to do as the birthdays roll by. Do I workout all the time? Nope. Do I go to the gym? No. I did when I was in school. Not anymore. Do I have limitless energy? Not at all. Do I feel great in my body all the time? No. Sometimes I just plain hurt! Do I have old injuries? Oh yes! Five knee surgeries and a handful of car accidents. Do my old injures bother me? Yes, some do. Do I have arthritis? Yup. Do I diet? Nope. I dieted once before my wedding. Zone Diet. Am I self conscious? Often. You get the picture! I have similar struggles as the majority. So why is it that I can still move around an agility course with my dog? Why is it that I can recover from the aches and pains of age and past experiences? It’s simply this…I train with purpose and intention. I don’t do mindless exercise. I don’t workout daily but when I do, it’s thoughtful exercise with a functional purpose. I listen to my body and respect the information it gives me. If it hurts I don’t do it. 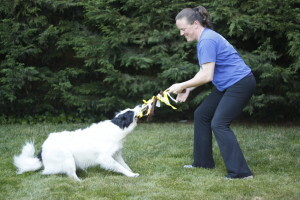 I practice good body mechanics as much as I can and I apply them when running agility with my dogs. I avoid repetitive physical stress in daily activities. I recognize my limitations and I honor my efforts to physically improve, maintain or recover. I take note of my strengths and I play to that advantage whenever possible. I rest. I splurge. I work hard. I take time to nourish my soul and comfort my heart. I recognize pain, physical or emotional, and I am kind to it. Most importantly, I LISTEN. I listen to what feels good in my body and what does not. I listen to what my body needs and try to act on it. I listen while I move and I apply that feedback in my movements. Your body is your greatest source of feedback for any physical activity and age is a beautiful reflection of your experience. Embrace it’s wisdom. *For more information about Certified Athletic Trainers, visit the National Athletic Training Association. Beautiful words. And more true the older we get. 1 Pings/Trackbacks for "Aging: A Reflection of Experience. A Lesson in LISTENING"